I recently stumbled upon this fabulous portrait of Lady Mary Wortley Montagu (1689-1762), painted in 1717. Lady Mary is a fascinating historic character, she traveled through and wrote extensively on Turkey, helped bring the smallpox vaccination to England, and was at one point engaged to a man with the greatest name in the history of the world- Clotworthy Skeffington (who looks exactly how his name sounds). She also seems to be a fashion psychic. When Lady Mary's husband was appointed ambassador to Istanbul, she took the opportunity to absorb as much of this new culture as possible. 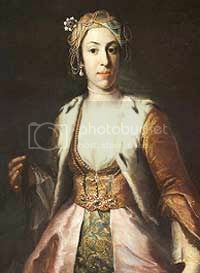 When she did return to England, she brought a Turkish fashion sense with her which caused orientalist trends throughout Europe. Several of her portraits show her dressed in a Turkish or Turkish-esque style, attesting to her love for the exotic. I find this particular portrait interesting due to it's contrast to the fashions of the day, which featured a natural waistline and a full skirt. 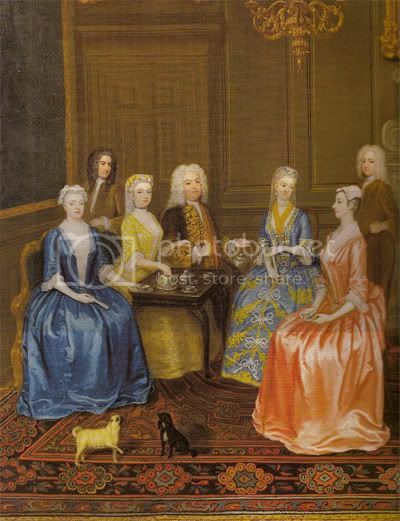 This painting is from 1730, but gives you the general idea of the silhouette of the early 18th century. Detail of A Tea Party at Lord Harrington's by C. Phillips from 1730. Other portraits of Lady Mary in her Turkish garb show some nod to the fashionable silhouette of the day. The below portrait, for example, shows the full skirt and natural waistline featured in the fashions of the western world. But Vanmour's portrait of Lady Mary shows her wearing a narrow dress with a waistline under the bust. 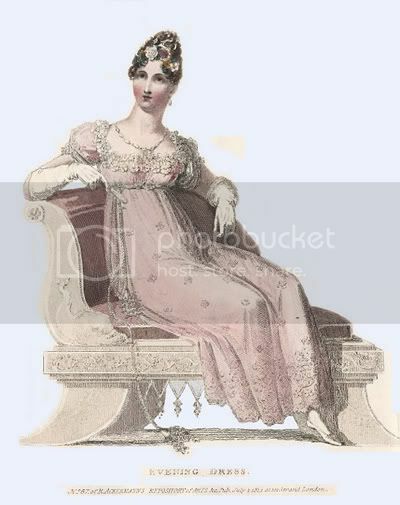 I could not help but think of fashions from the Regency period, which would come about almost a century later. Lady Mary was a woman ahead of her time in many respects, but it also appears she was quite ahead of the trends in fashion!